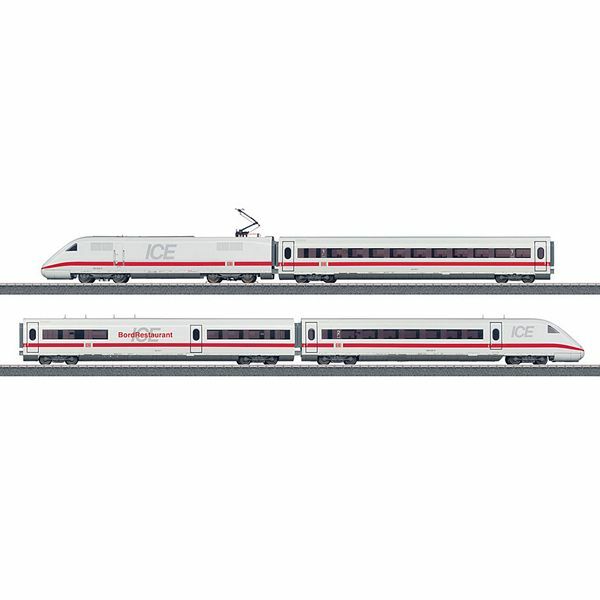 Prototype: German Railroad, Inc. (DB AG) class 402 InterCity Express. Four-part train: powered end car, open seating car, 1st class, Bord Restaurant dining car, and cab control car, 2nd class. Model: The powered end car has a digital decoder and factory-installed sound functions that can be controlled. It also has a special motor. 2 axles powered. Traction tires. The headlights will work in conventional operation and can be controlled digitally in the powered end car always on in the cab control car. The pantographs can be raised and lowered but are not wired to take power from catenary. Train length 102.7 cm / 40-7/16. Sound: horn and station announcement.